Happy New Year! In 2012, my New Year's Resolution was to start this blog. I hope you've enjoyed reading it as much as I've enjoyed writing it! Reel Seafood Grill opened in June 2013, by the folks who co-founded Bert’s Seafood, a former Greensboro staple. The interior is casual and inviting; a welcoming bar and patio provide additional seating. I’m glad there is another seafood restaurant in Greensboro, and Reel is much more accessible than others in the area. Most entrée prices range from $15-$30, but you get a ton of food (2 or 3 sides with each entrée!) and the menu is flexible, if you'd rather have one of their unique sauces atop a different fish than the menu reads. Plus, Reel got a soaring review from N&R Food Writer John Batchelor, so you know it's a top spot. I was slightly thrown by the menu – it’s on two chalkboards on the walls – but it makes sense, considering how frequently they change it depending on the availability of fresh fish. Our friendly server was extremely helpful, describing the entrées when requested, since the chalkboard doesn’t leave a ton of room for adjectives and descriptors. 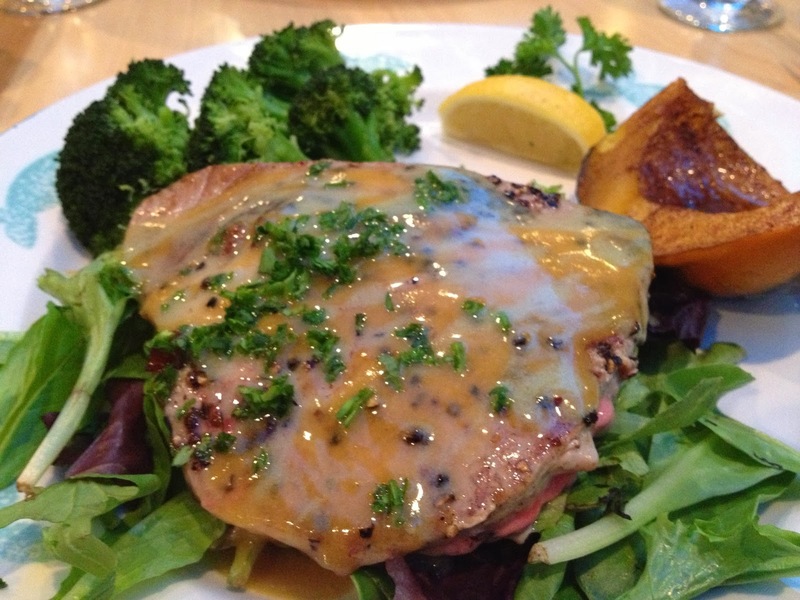 The Singapore Tuna is glazed with a spicy Wasabi Sauce. It is delicious, and for heat-seekers only. Each bite gives you the rush you look for when using Wasabi. It really cleans out the sinuses. This is served on a bed of greens, so the delicious glaze becomes a dressing. As mentioned, entrées come with three sides, thankfully, because all of them sound fantastic. I chose Baked Acorn Squash (slightly sweet, one of my favorite veggies of the season), Quinoa (notes of Vinegar, with Asparagus and Feta – my favorite of the sides) and Steamed Broccoli. Why Broccoli, you ask? It’s post-holidays. Have to Reel (ha!) in the splurging sometime. My dining partner was weary of the heat and chose to have her Tuna sans sauce, which you can do with any fish. The three sides sampled with this dish were Garlic Cheese Grits (love that this is offered as a side, but a pinch or two more of salt would be an improvement), Potato Latkes (essentially like shredded Hash Brown Cakes, with wonderful onion flavor) and Hush Puppies, because it is a fish joint after all. Hush Puppies are round and slightly sweet, just the way I like them. What really sold me on this place was the dessert selection. All desserts are made in-house, and the owners encourage the chefs to stretch their imagination and offer unique varieties, including White Chocolate Banana Bread Pudding, Cookies’n’Cream Cheesecake and the one I sampled: Butterscotch Coconut Almond Pie. OH MY LORD. This Pie. Served warm, a la mode (per our request) with whipped topping, it is one of the most outstanding restaurant desserts I’ve ever had. And I know my desserts. The consistency is much like a Chess Pie, studded with Butterscotch Chips, topped with crunchy slivered Almonds. I couldn’t decide if this is heavenly or sinful. It’s both. How can you really decide when something is one or the other?